As the largest natural lake west of the Mississippi River and the largest salt water lake in the western hemisphere, the Great Salt Lake is perhaps the best known geologic feature in the area. 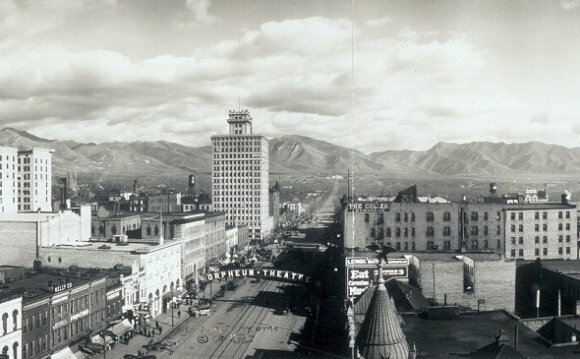 The city even takes its name from the lake - originally it was Great Salt Lake City, but the "Great" was dropped from the name in 1868. The lake has a rich history, interesting features, plays an important role in the ecosystem and provides abundant recreational opportunities. The Great Salt Lake is the remnant of Lake Bonneville, an enormous prehistoric lake that covered a large portion of western Utah. If you look around the Salt Lake Valley, you can see remnants of the shoreline of Lake Bonneville as terraces on the mountainsides. You can even hike or bike along that ancient shoreline if you follow the Bonneville Shoreline trail. The lake was well known to Native Americans, but was first seen by Europeans Jim Bridger and Etienne Provost in 1824. After the area was settled in 1847, some settlers (and later others) claimed to see what has become known as the North Shore Monster - the Great Salt Lake's version of the Loch Ness Monster. The lake is very shallow (current maximum depth is only 35 feet), so the area it covers varies depending on how much snow melt and runoff reaches the lake. During an average year the lake covers about 1, 700 square miles. In 1963 the surface area reached a historic low at 950 square miles. Just 25 years later, in 1988, it reached a record high of 3, 300 square miles. The large surface area of the lake and shallow depth contribute to area snowfall with "lake effect" snowstorms in winter and thunderstorms in summer generated by warm evaporating water meeting colder air as it reaches the nearby mountains. The lake and its islands offer residents and visitors opportunities to sail, kayak, float, birdwatch, hike, bike and more. At the Great Salt Lake Marina you can launch a kayak or boat, go on a sunset cruise, or take in the spectacular view. Nearby is the Saltair - a resort that has been rebuilt three times in its history, and is currently used as a concert venue. The best place to swim or float in the lake is at Antelope Island State Park, where white oolitic sand beaches provide easy access to the lake without the brine flies that are prevalent on other areas of the shoreline. The beach area also has showers to rinse off the salty water. Floating in the lake is a unique experience because the high salt content makes it easier to float. Antelope Island also has hiking and biking trails, spectacular views, and the historic Fielding Garr Ranch. If you visit near the end of October, check out the annual Bison Round-up where the free ranging bison on the island are gathered together on the north part of the island. If your visit happens during other parts of the year, be sure to check out the other events happening at Antelope Island or the Marina. It's a lake, so what about the fishing? There is some limited fishing available near the marina and the other fresh water inlets to the lake. Because the lake has no outlet and only loses water by evaporation most of the lake is too salty to support fish or other aquatic life larger than algae and brine shrimp-the larvae of brine flies. The lake has salinity that ranges from two to seven times as salty as the ocean. The salt and other minerals in the lake come from the minerals in the water from the ancient lakebed and the river water that flows into it. There are very small amounts of minerals in the water from the Weber, Jordan and Bear Rivers - the three major rivers that feed into it - but the water evaporates from the lake leaving the salt (and other minerals) behind. There might not be fishing or other large aquatic creatures in the lake, but the lake is an essential part of the ecosystem because of the extensive wetlands that are along the shore of the lake and the brine flies and shrimp are essential food sources in those wetlands. The Great Salt Lake Shorelands Preserve is part of the wetlands of the Great Salt Lake. The preserve and other wetlands of the lake provide an essential stopping point in the migration of millions of migratory birds including: Wilson's phalarope, red-necked phalarope, American avocet, black-necked stilt, marbled godwit, Snowy Plover, western sandpiper, long-billed dowitcher, tundra swan, American white pelican, white-faced ibis, California gull, eared grebe, peregrine falcon, bald eagle, and various ducks and geese. This makes the area around the lake a great place to go bird watching. The Shorelands Preserve even has a handicapped accessible boardwalk that provides close up access to see the birds. In addition to spectacular views of the surrounding mountains, the lake itself and the wildlife, the northwest arm of the Great Salt Lake is home to a land art installation work by Robert Smithson called The Spiral Jetty. Constructed in 1970, the land art is visible above the water as white salt encrusted rocks in a spiral formation. When the lake is high enough to cover the rocks, the installation is still visible from the air during a scenic flight.